My pop culture buddy, Malcolm (Pop Culture Dish), posted his list of his five favorite songs with "You" in the title as part of a blogging roundhouse (a meme) and I thought it would be fun to play! 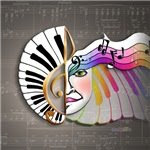 Playing this game was fun because you get to see the musical differences in generations - look at the songs on Malcolm's page and on another pop culture blogger friend of his and mine, Pjazzypar - Traces of a Stream. Adding Bobby Vinton to the list reminded me of my very first boy/girl dance in junior high. I remember my dress, I remember the cheesy crepe paper decorations and I remember Bobby Vinton singing Blue Velvet. Every time I hear that song I still see that school gym, the dim lighting and I am transported back to being 13 again. My gawd, was I a doofus, lol. Get something for "YOU" with my Retro Inspired Pop Culture Art on Cool Stuff like Cups, Tees, Cards, Aprons and more at the POP ART DIVA BOUTIQUE! DAVY JONES - STILL A CUTE MONKEE! So, there I am, slumped in bed, eating Ding Dongs and who do I see doing a commercial for Gorilla Trades? Little Davy Jones, formerly of The Monkees Fame. It was so retro I almost choked on my ding dong! There he was doing a typical Monkee style dance with a guy in a gorilla suit - something you would easily have seen on the original tv show. In fact, I think they did do a "guy in a gorilla suit" scene and I wish I could find it for you, but, alas, no amount of searching for "The Monkees+guy in a gorilla suit+Davy Jones" brought me any satisfaction. 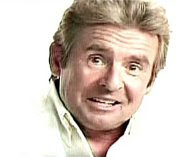 I did find the episode of Davy Jones on The Brady Bunch though - do you remember that one? Marsha, Marsha, Marsha sneaks into Davy's recording session (was there no such thing as rock star security in Bradyland?) and begs for Davy to go to her school prom. She gets booted - I guess being President of the Fillmore Junior High Fan Club didn't have the pull Marsha, Marsha, Marsha had hoped for! BUT, We all know what happened, Davy shows up and woohoo, Marsha, Marsha, Marsha is popular again! Ah, isn't it lovely to be a Marsha in the land of seventies sitcoms? Anyway, it's good to see Davy Jones still out there plugging - even if it is for a stock trading company - and still looking pretty darn cute doing it! WARNING! 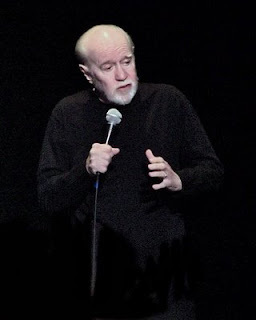 EXPLICIT CONTENT FOLLOWS - I'M POSTING GEORGE CARLIN'S SEVEN WORDS YOU CAN'T SAY ON TELEVISION! George Carlin has passed away at age 71. He died last night at St. John's Hospital in Santa Monica after being admitted for chest pains. For those of you who came of age in the sixties and seventies like me, George Carlin was our comedic anti-hero. A foul mouthed but brilliant defier of "Middle America" and one of the funniest men who ever turned a stage blue. This is the man who told us the "Seven Words You Can't Say on Television", this is the man who thumbed his nose at convention with his tongue firmly in cheek. This is the man who made us laugh at our middle class "morals", who made us think and who always kept us up to date on the silliest pop culture and current events. He made counterculture his own and he did it with humor and insight. Farewell, George - I hope you're turning the air blue in the great cosmic joke we call the Universe! George Carlin photo courtesy of Point-Shoot-Edit's photostream. MIGHTY MOUSE IS ON THE WAY! It's Saturday morning! Time for Saturday morning cartoons while you sit in front of the television in your jammies eating a bowl of cereal! Now, don't sit too close or you'll ruin your eyes - and don't sit in front of that TV all day, go outside to play and get some fresh air! ANSWERS TO THE LATEST QUIZ ON RETRO COMMERCIALS AND JINGLES and a little DENNIS THE MENACE! Ladies and Gentlemen, thank you for tuning in to the Pop Art Diva Blog on Pop Culture of Yesterday versus Today! Today you get the answers to last week's quiz on retro commercials and jingles, but first a word from our sponsors - that would be me :)! Are you an old hippie? Do you know an old hippie? Do you wish the sixties never ended? Do you secretly harbor a passion for hip huggers, love beads, incense and flower power? 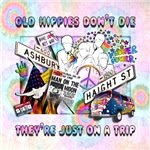 These fun products "OLD HIPPIES DON'T DIE - THEY'RE JUST ON A TRIP!" will bring groovy back into your life! Stop by the the Old Hippies Department at the PopArtDiva Boutique to get your fun sixties inspired cups, tees, aprons, pillows and more! Tune in, turn on and drop some cash today! 1. It's not nice to fool MOTHER NATURE! 2. Please don't squeeze the CHARMIN! 3. Charlie says "Love my Good and Plenty"
4. You'll wonder where the YELLOW went when you brush your teeth with PEPSODENT! 5. Who's slogan was this? "Look Ma! No cavities!" CREST. And the winner of the quiz is The Rock Chick! You Rock, you got them all - you are the official winner! NEW RETRO COMMERCIAL QUIZ and some MONKEE-ING AROUND! Below is my new quiz for all you pop culture retro commercial fans. 1. It's not nice to fool _ _ _ _ _ _-_ _ _ _ _ _! 2. Please don't squeeze the _ _ _ _ _ _ _! 4. You'll wonder where the _ _ _ _ _ _ went when you brush your teeth with _ _ _ _ _ _ _ _ _! 5. Who's slogan was this? "Look Ma! No cavaties!" I'll post the answers early next week. Okay, kids, you had a good try at it and some (Pjazzy!!!) came pretty close with only one answer missed! Bev, you got all but two - and you were the only one who knew #3 as well as #4, which makes me wonder just how much laundry you've done in your lifetime, lol! I have to admit I was pretty impressed by the number of you that got Peter Pan!!! That was really pretty old and obscure - how many of you knew that it was a reference to saving Tinkerbell in the J.M. Barrie classic, Peter Pan? "Do you believe in fairies? Say quick that you believe. If you believe, clap your hands! Don't let Tink die!" My age group was introduced to this classic by Mary Martin playing Peter Pan. I think this started the tradition of a woman playing Peter Pan! I remember they used to run it right around Christmas every year for a while and I always looked forward to it. I wanted my own fairy! Some years later, when I was in college, I got myself a female cockatiel and named her Tinkerbell, she became my wonderful and entertaining little "fairy" for 15 years. I got a male as a mate for Tinkerbell and named him Peter Pan. A few of you know that I just lost my little Petey recently - he was 37 years old. I miss my little fairies. Off the subject, but hey, I'm old - my mind wanders! Anyway, you all did pretty good - I'll have to work harder to stump you all next time! 2. Tareyton smokers would rather fight than switch. 3. Ajax, the detergent that's stronger than dirt. 4. All - Tempa - CHEER. 5. If you believe in peanut butter, you gotta believe in Peter Pan. 6. Hey! How 'bout a nice Hawaiian Punch? 7. Snap! Crackle! Pop! Rice Krispies! And check my soundboard from the last post - I've added a few new retro sound bytes for you. I'll put the player on the blog here permanently if I can add it to the bottom of the page - it's too wide for my right side bar and I tried to mess with the flash code to make it smaller but, alas, I am not doing something right, lol. 1. _ _ _ _ _ _ _ tastes good like a cigarette should. 2. _ _ _ _ _ _ _ smokers would rather fight than switch. 3. _ _ _ _, the detergent that's stronger than dirt! 4. All - Tempa - _ _ _ _ _. 5. If you believe in peanut butter, you gotta believe in _ _ _ _ _ -_ _ _. 6. Hey! How 'bout a nice _ _ _ _ _ _ _ _ -_ _ _ _ _? 7. Snap! Crackle! Pop! _ _ _ _- _ _ _ _ _ _ _ _. And a little treat - my new soundboard with a retro jingle! FINALLY - SOMEONE PLAYED THE RETRO COMMERCIAL/JINGLES GAME! Thank you for playing my game and actually posting your answers!!! For those of you who missed it here's the original post with the retro commericial/jingles game trivia questions. 4. brush your teeth with Pepsodent - Remember Bucky the Beaver? 6. It's Howdy Doody Time! 7. not in your hands! 11. wouldn't you like to be a Pepper too? 12. ate the whole thing! 14. oh what a relief it is! 15. n E S T L E s, makes the very best CHOCOLATE! 16. lickin' and keeps on tickin' - almost, but no cigar! 19. sky blue waters, again almost but not quite clear, lo. 21. Arpege - sorry, you missed that one!